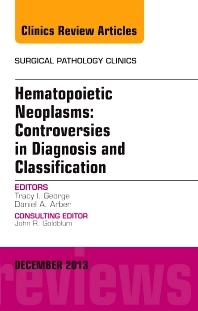 Topics in Hematopoietic Neoplasms: Controversies in Diagnosis and Classification include: ABC vs GC subtyping of diffuse large B cell lymphoma-Does it matter? ; Clonal link between malignant lymphoma and histiocytic tumors; Diagnostic criteria for grey zone lymphoma: Are there any? ; Diagnostic criteria for primary cutaneous B cell lymphoma; Distinguishing reactive and leukemic large granular lymphocyte proliferations; Differential diagnosis of erythroleukemia; Early pre-T ALL versus MPAL: Diagnostic criteria; Myeloid neoplasms with inv(3) or t(3;3); Update on classification and prognosis in myelodysplastic syndrome; Approach to atypical immunophenotypes in Hodgkin lymphoma; Blastic plasmacytoid dendritic cell tumor: How do you distinguish it from acute myeloid leukemia? ; The differential diagnosis of eosinophilia in neoplastic hematopathology; Transformation in myeloproliferative neoplasms; and Challenges in consolidated reporting of hematopoietic neoplasms. This publication is an extremely useful and practical source for pathologists working with this spectrum of disorders. As with all publications in this series, Differential Diagnosis is the main focus of discussion. Staging, Diagnosis, Prognosis, and summaries of Pitfalls in working with these pathologies are presented along with ample figures.